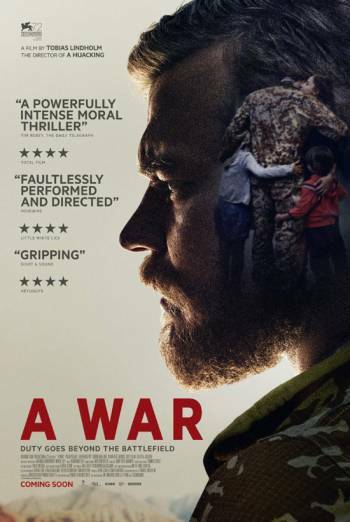 A WAR is a drama about a company of Danish soldiers in Helmand, Afghanistan, and the consequences when their commander is accused of committing a war crime. There is strong injury detail, including in a scene after a soldier's legs have been blown off by an IED and his colleagues try to save his life as blood pours from the stumps. In another scene soldiers try to help a colleague who has been shot in the neck. There are also some still photographs presented as evidence in a trial showing dead children after a bombing attack, including a girl whose foot has been blown off. Strong language ('f**k'), as well as milder terms such as 'crap'. Further issues include tense sequences and some moderate violence as the soldiers and others shoot at each other.